Most people think naively that their computers are impenetrable when logged off, because they have reset Windows 7 passwords and of course no one is able to guess the random 12 letters, so they feel safe to keep all their valuable information on their computers, such as bank statements, contacts, and pictures, etc. Actually, WRONG! A computer can be easily logged into. 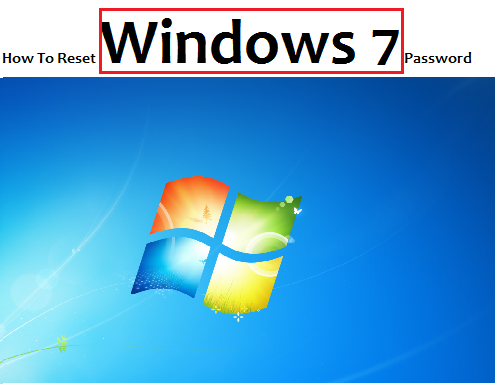 Now we will demonstrate that how to reset Windows 7 passwords to login Windows. Hop it will encourage you to encrypt and reset Windows 7 passwords to protect your individual folders. 2. Download a password managing tool, such as password recovery software. 3. Burn the software program into a CD. 4. Select a computer you want to crack. 5. Put the disc into the optical drive. 6. Turn off the computer by pushing and holding the power button for a long time. 7. Press the power button again in order to turn it back on. 8. At start up, press the prompted button in order to enter the BIOS. 9. Enter BOOT ORDER and change the boot order so that the computer will boot from CD before HDD. 10. Select SAVE and then EXIT. 11. The program now will begin to start up. Wait a couple of minutes for it to load up. 12. When it starts, the program will automatically begin searching for Windows 7 passwords. 13. After the program finishes searching, it will show a list of USERNAMES and the corresponding Windows 7 passwords. 14. Write it down in a piece of paper and take out a blank CD. 16. Now you have successfully reset Windows 7 passwords. 17. Type the Windows 7 passwords it has recovered and you're able to login to Windows.